A sense of irony and humor was vital to U.S. military personnel in Vietnam. They would often take names of places they knew back home and apply them to areas in Vietnam where they served. Happy Valley, as every Penn State fan knows very well, is the home of Penn State’s main campus in State College, PA. In Vietnam, Happy Valley was not a happy place, either for U.S. or enemy soldiers. The area was covered by thick undergrowth and elephant grass that grew as tall as ten feet. That, of course, made combat operations extremely difficult and dangerous – and made it a great place for a major Viet Cong and North Vietnamese Army base camp. It was better than great, because it was a perfect place to infiltrate men and materials for operations around Da Nang, its port facilities, and Logistics Command. From the surrounding hills, within 12 km of the city and its military operations, the enemy could fire rockets and other weapons effectively. Defense of the area was partially the responsibility of the 1st Battalion 7th Marine Regiment. 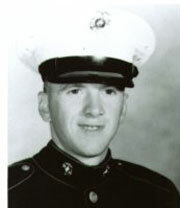 PFC Richard L. McNeish was assigned to Company B of that battalion after arriving in Vietnam on September 20, 1967. Barely more than a month later, on October 24, he went out on patrol with his unit. He was killed by an enemy explosive device. PFC McNeish was the son of Kermith and Clara McNeish. He had enlisted in the Marine Corps during April, 1967. He was the ninth Mercer County serviceman killed in the Vietnam War.